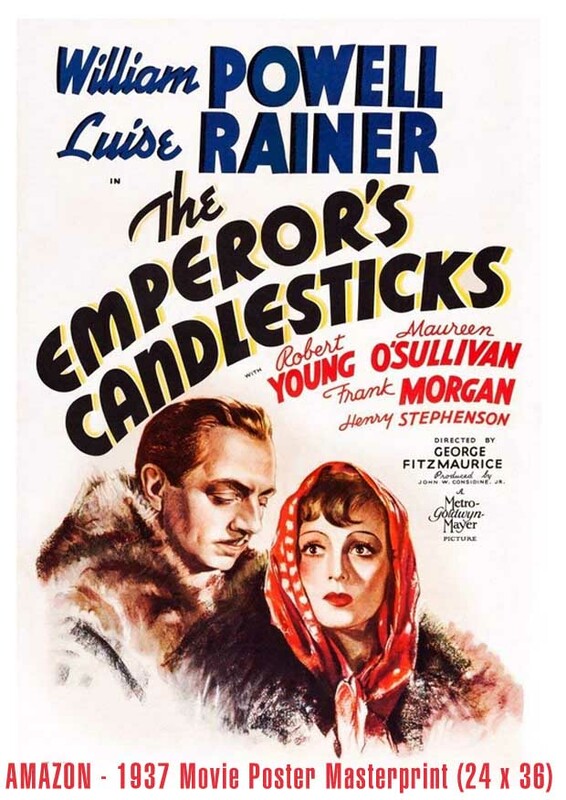 Though visually an effort in romance for the two leads (William Powell and Luis Rainer), The Emperor's Candlesticks is also supposed to be an espionage thriller. Competing spies from very opposite sides (Poland vs. Russia) discover a yen and admiration for each other, a complicating factor that story writer Baroness Emmuska Orczy uses to good effect (Orczy is more famous for authoring the frequently filmed The Scarlet Pimpernel). The Hollywood version of The Emperor's Candlesticks doesn't stress the tension between Poland and Russia except at a few key points, instead concentrating on the way love overcomes emnity (and can provide light comedy), a nice theme, but in hindsight not very clairvoyant - two years following this movie's release, Russia invaded Poland. Luis Rainer (Countess Olga Mironova) is an intelligent and clever spy who takes pity on Powell (Baron Stephan Wolensky), and visa-versa, as the two race across Europe on separate missions to deliver a pair of candlesticks to the Russian Tzar - - inside the candlesticks are hidden coded messages that will matter in the life and death of the Tzar's son Grand Duke Peter (played by Robert Young) who is being held hostage to pressure the Russian king to release Maria Orlich's (Maureen O'Sullivan) father, a Polish radical who is imprisoned and slated to be executed by the Tzar's highly feared secret police. The love story between O'Sullivan and Young's characters is a side romance centered primarily around an elaborate grand masque ball given in Vienna, and the M-G-M art department delivers a grandious vision of turn of the century European opulance as the waltz music plays and the two junior love birds flit about in costumes - - this turns out to be a ruse, though, and political realities rearrange the fun into a life-or-death struggle over candlesticks. But the real story is about Powell and Rainer. The irony of the romance between these two spies is that one (Rainer) is carrying a message that is a death sentence for the other spy (Powell) who is carrying a message that, if delivered, will show that the first spy (Rainer) has failed a different important task and would subsequently be punished for this with death by the only emphasized villains of the tale: the Tzar's secret police.